The theatre faculty of the Akademi Seni Budaya Dan Warisan Kebangsaan (Aswara) is taking up the challenge to stage William Shakespeare’s Hamlet in Bahasa Malaysia. The 75-minute tragedy, written by the 17th century poet, playwright and actor, will feature more than 40 students. The play tells the tale of Danish prince Hamlet, who is unhappy that his mother, Queen Getrude, has married his uncle Claudius soon after the death of his father, the king. His life changes when he encounters the ghost of his late father. Stricken by grief, Hamlet is convinced that Claudius has committed murder for the sake of stealing the throne. He then plots to kill his uncle to avenge his father. But as revenge consumes him, Hamlet soon finds his life, and his kingdom, thrown into chaos. Fasyali feels that the themes in the play resonate with us, our own community, nation and desires. He adds that he wants his student actors to explore human emotions, and he finds Hamlet to be the perfect play for them to do that. Some may see Hamlet as a man who is slowly losing his mind but Fasyali does not share such sentiment. Final-year student Afiq Azhar Ali, who is taking on the lead role, is happy to be playing Hamlet. He confesses that he has seen many film versions of the play, from the 1990 film starring Mel Gibson, to the 1996 version starring and directed by Kenneth Branagh. “I learn something from these actors but I will not be imitating them,” says Afiq, who wants to inject his own style into the Hamlet. Initially, Afiq was given the role of Claudius. But he was eager to play Hamlet and begged Fasyali for another chance. The director was so impressed with his determination and his second audition that he finally gave him the role. Nurul Wardah Mohamed Sharif is the person in charge of the play’s production. This final-year student in the faculty of arts and culture management understands that Hamlet would not be an easy play to stage. One major change they have made to the play is setting the story in a fictional country in the Malay Archipelago. It will also feature elements of Malay culture, including Mak Yong and Bali mask dances. Fasyali says setting the play in an ambiguous, but familiar, environment and culture will give the production team more room to be creative in terms of set, costumes and story presentation. Nurul Wardah is up to the challenge. She points out that Aswara is training them to be excellent so that they will be marketable when they graduate. 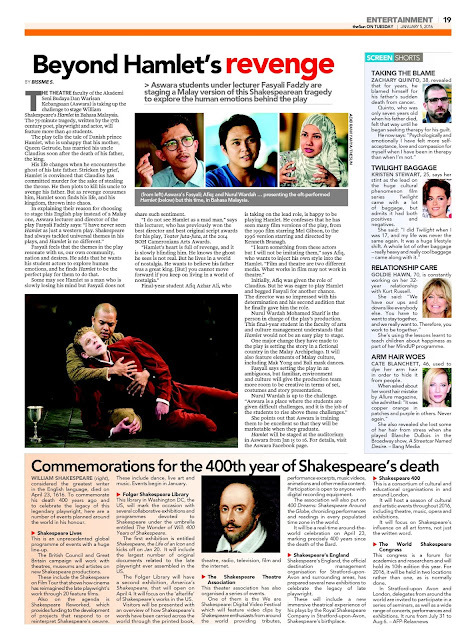 Hamlet will be staged at the auditorium in Aswara from Jan 15 to 16. For details, visit the Aswara Facebook page.